Five school building projects in Bristol have gone a total of £7.9m over budget, the councillor responsible for the city's schools has said. The largest overspend is at Redland Green School, where costs were originally estimated at £30.5m, but have since risen to £36.4m. Councillor Derek Pickup is calling for an inquiry by the authority's Audit Committee into the overspend. The city council said the figures were "more or less" correct. 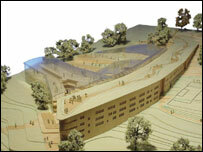 A spokesman later said the Redland Green overspend was £5.2m. "The school will deliver one of the most modern, state of the art learning environments in the south west," he said. An external construction consultancy has now been brought in to look at the extra costs and the council is also taking legal advice. Mr Pickup, responsible for Children's and Young People's Services, told the BBC: "I find it unbelievable. "Redland Green is very concerning and we've been concerned about that for some time. "What happens now depends on who's at fault." More than 690 children applied for 176 places at Redland Green for the coming academic year. It is already open off-site: years seven and eight, and the first year 12 intake will be based at Redland from September. The council said that of the pupils who did not secure places, about 100 live within the catchment area. Of those children who live in the catchment area and secured places, not one lived further than 1km from the school, it said.